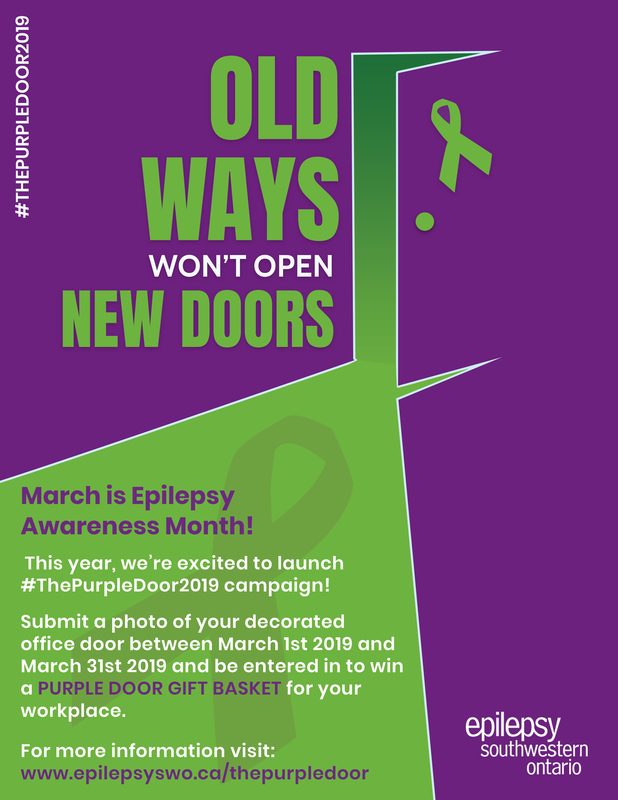 Submit a photo of your decorated office door between March 1st 2019 and March 31st 2019 and be entered in to win a PURPLE DOOR GIFT BASKET for your workplace. With your submission, your office will be entered into a draw. Be sure to share your photo using the hashtag #THEPURPLEDOOR2019 on social media. On Thursday, April 4 2019, Epilepsy Southwestern Ontario will announce which workplace has been randomly selected for their purple gift basket. Book an Epilepsy Awareness Month Workplace Support presentation! Epilepsy Southwestern Ontario provides free epilepsy and seizure first aid presentations (commonly referred to as Seizures 101 presentations) to members of the community groups and workplaces. Presentations range from general knowledge to epilepsy care and management; all presentations include seizure identification, epilepsy information and seizure first aid. Format: Educational videos and PowerPoint used with resource materials for each group. Length: 45-60 minutes based on time allotted. Required Tools: Presentations require access to a computer, speakers and a data projector.